Like many other things in Turkey, this one seems very strange the first time it happens and then quickly becomes routine: You bring a small child into a restaurant or cafe, the waiters (yes, men) will almost invariably start to coo over him, ask to hold him, and then walk him around the premises, completely disappearing from your sight, before eventually returning the child, likely along with some unsolicited parenting advice. Having a kid in your social group certainly gives foreigners some different insights into the local culture -- in our case mainly the nosiness, overblown health concerns, and different gender expectations that can characterize certain groups of Turks. Like the way men here are often both very macho and extremely affectionate with each other, the sight of a hipster young man (carefully askew hair, elaborately detailed jeans, too-tight T-shirt with some kind of grammatically incorrect or just slightly odd English-language saying on it) making googly eyes at a baby on the ferry seems dissonant at first, but is also incredibly sweet. 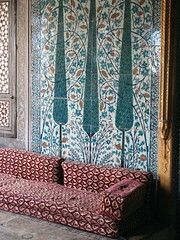 Turks also generally don't hesitate to pry into your private business, especially if there is a child involved. We all got a good laugh for many weeks (OK, months; we're easily amused) out of an evening when our little friend Davey was wailing inconsolably at dinner and one of the guys in the group decided to walk him around the neighborhood so his mom could actually eat a few bites of food. He came back a bit shaken -- as Davey continued to cry, women apparently started scolding our friend who was carrying him, saying accusingly, "Where is that baby's mother?!" One even offered to let them come up to her house so she could take care of the bebek properly. Perhaps due to some odd differentiation between health concerns and safety ones that I still fail to understand, young Davey's parents were also often harangued by their neighbors for not having him bundled up tightly enough. So often were they greeted thusly when they stepped out of their apartment, they took to swaddling him in hat and jacket even on a warm spring day, then removing the extra garb once they got a few blocks away from the prying eyes. But in the same neighborhood, children play until all hours on the street, sliding down the oiled-slicked hills on flimsy pieces of cardboard, careening at the last minute away from cars screeching around the corner. Apparently that's not as dangerous as the possibility of catching a chill. 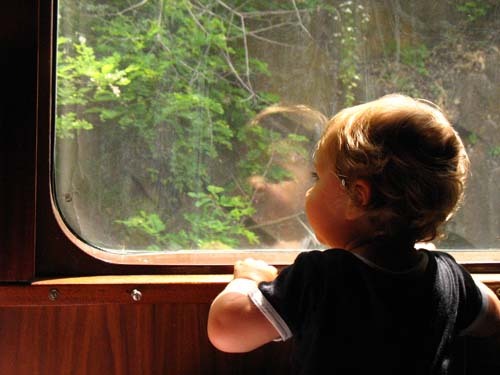 NOTE: Turkey's not the only place where travelers + children = interesting experiences. 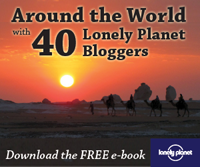 Check out other Lonely Planet travel bloggers' accounts from Fiji, Korea, Portugal, Uganda, and more in the Blogsherpa Blog Carnival: Kids Around the World, hosted by Glennia Campbell of The Silent I. Choosing not to have children also brings unsolicited advice. My neighbours have noticed that I'm in my mid-30s with no kids... you would not believe the number of business cards and phone numbers I've been given! Everyone knows a doctor or a therapist who can help me with my "problem." They want me to call right away. I love how they assume the "problem" lies with me rather than my Turkish boyfriend. When I tell them that I've *chosen* not to have children, I get bizarre looks of horror mixed with incomprehension. This used to happen to us in other parts of the world as well--the constant attention to the kiddo, plus the unsolicited advice on what he was/was not wearing. Great post! Thanks for sharing it on the Blogsherpa Blog Carnival! - he did walk everywhere without shoes on. Hilarious list, Boncuk, thanks for sharing! Great post, Jen. I remember when we took our then six-month-old son to visit his Turkish grandparents. My mother-in-law whisked him off to see the neighbors and he came back covered with those little gold medallions that Turks pin on babies for good luck. How my son handled all the attention and how he withstood the stifling sweater BabaAnne put him in (it was July) is beyond me. These are the types of experiences I hope to write about at my blog www.justineickes.weebly.com. Sounds like your son got the full Turkish experience, Justine! Good luck with your blog.